Preserved animal bones may be seen as decoration or teaching tools. 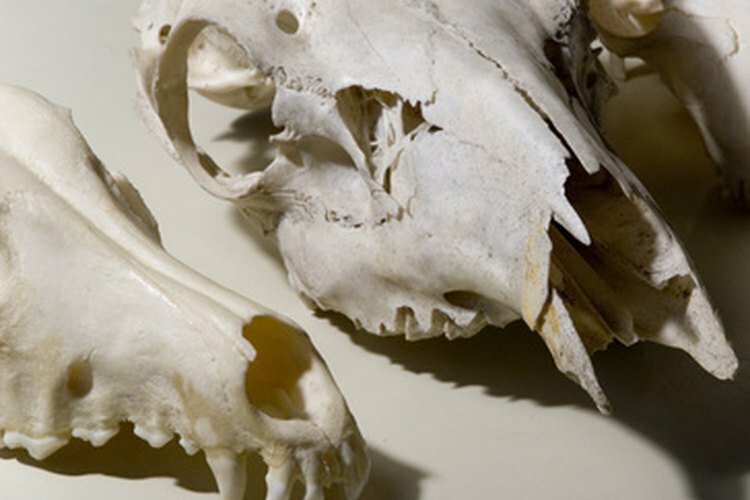 There are several reasons to preserve animal skulls. When found in nature, a skull can be seen as something beautiful and can be made into a piece of art. A preserved skull can show off success and skill during a hunt. Skulls can also be used as teaching and educational tools--ways to show animal biology, evolution and habits in an up close and personal way. Remove flesh by hand. Use your knives to cut and scrape away as much as the skin, muscle and brain tissue as possible. You may need to use smaller knives to work around finer areas like jaw hinges and ears. Be careful not to scrape too hard because you do not want to cut or damage the skull you are working to preserve. To remove brain tissue, break it apart. Feed a wire with either a bend or loop at the end of it into the brain cavity and whip it around like you were whisking eggs. Flush the brain cavity with water to drain the tissue out. Remove remaining flesh. Use one of these three methods to remove the last of the flesh. Put the skull in cold water with about 2 tablespoons of laundry detergent. Check the skull periodically to see when the rest of the tissue loosens and can be removed. Boil the skull gently in water. Submerge the skull completely in water and bring the water to a gentle boil. Check the skull often to see when remaining tissue loosens, falls off or can be removed. This method also destroys bacteria and other pathogens. Take care not to boil too long, as this can damage skulls. Collect Dermestid beetles and let them feed on remaining flesh. You can buy these beetles from a taxidermy shop. Put your skull in a box with the beetles and check on it periodically to see when they are done feeding. Bleach the skull if desired. Soak the skulls in a solution of hydrogen peroxide and water that is between 3 percent and 6 percent hydrogen peroxide. Bleaching times will vary by size and density, so check on your skull often until you have reached the desired color. Be careful not to bleach for too long or you can damage the bones. Use a towel to dry your skull. Leave the skull out to air-dry to make sure the skull is completely dry. Seal the skull. Use a lacquer solution or polyurethane spray to cover your skull in sealant.